RAILROAD.NET • View topic - D&H C628s & trying to find current photos of 610. However I have not been able to locate a single photo of it after October 2001... just hoping that someone may have come across more recient pics - or have seen it in person - and could give a little update. As for the info I've got, it's the last D&H C628 left, and probably was the only D&H unit to survive past 1999. 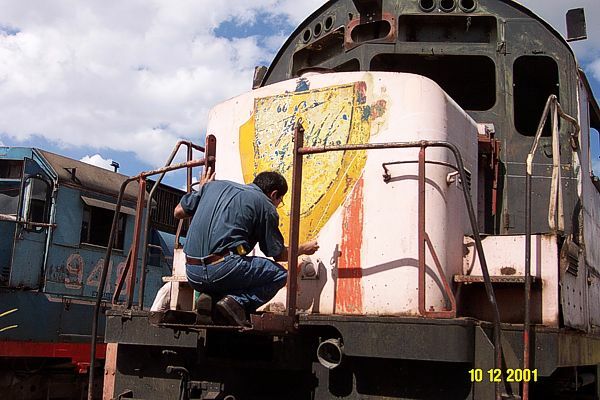 I recall reading a little news article in Trains in mid '99 that basically said the Alco days in Mexico were over, and that the D&H C628s were being scrapped. Then I heard stories in the fall of '99 that at least one of the D&H C628s was left... After a little research, I learned of the confirmed existance of the 610, and no others. It would seem that the all the rest of the D&H units were gone by the summer of 1999, if not earlier. Does that seem like an accurate time frame? BTW: Ironically, this unit is not the only C628 at the museum. Former FCP #606 is there as well, and though it carries a 600 series number, it was built new for the FCP. Re: D&H C628s & trying to find current photos of 610.
and a third in Australia. D&H 610 is the only one of the three that operated with a US railroad. they list 610 as being in their collection, but they only have that one photo on their page! from 2001..weird..maybe nothing new has happened in the last 9 years? further googling couldnt bring up anything else..
well, at least she is preserved! thats a good thing.. I am not sure that the ones in Mexico are "preserved" as opposed to "saved," but at least they still exist. Well, they are in a museum..
and from what reading I could find, it seems to be one of the better railroad museums in Mexico..
and the Mexicans are very proud of their two remaining D&H Alco PA's, and take good care of them..
so I would consider the C628's preserved..but yes, "preservation" is very subjective! unless we find recent photos of the C628's languishing out on a back lot or something..
but from what little we do know, they seem fairly well taken care of for now..
Last edited by scottychaos on Sat Jul 31, 2010 8:59 am, edited 1 time in total.